Today is a big day in my life, as in a few hours I will present the first five wines of my Waitsburg Cellars label to the trade. Waitsburg Cellars came about as the result of a conversation exactly one year ago, with Andrew Browne and Alex Evans, principals at Precept Wines. Their proposal was breathtakingly simple. Would I be interested in designing and creating a wine, using the resources of their vineyards and facilities? This simple proposal set in motion a very busy year, initiated some sweeping changes in my work life, and brought me to this exciting moment, when the wines make their public debut. Today we will show four white wines and one red blend. My goal has been to design and create wines that are unique in some way. I did not want to do yet one more version of wines that already are widely-seen in the marketplace. At the same time, I wanted to showcase some strengths here in Washington state, strengths that had occurred to me but that had been overlooked by the market. The first wine I conceived of was a red blend. It existed on paper before I had sampled a single barrel. After months of barrel tastings, a series of knock-down, winner-takes-all blending trials, and lengthy discussions with my Precept partners, our 2011 ‘Three’ Red was finished and bottled last summer. It’s a blend of 65% Merlot, 20% Malbec and 15%Mourvèdre – a mix I have never seen before. “The name ‘Three’ reflects the three winemakers, three vineyards, and three grapes that all contribute to the realization of this unique wine. Each has an essential role to play. Merlot provides the muscle, Malbec brings the magic, and Mourvèdre adds a touch of minerality. Together, they create a wine that has classic fruit, a fine focus, great structure, perfect proportion and crisp detail. I have tasted it about once a month since it was bottled, and watched it go through some ups and downs, as young wines are prone to do. The basic goal – to showcase fruit, to create a red wine with dense aromatics, bracing acidity, good length and some aging potential – has been achieved, at least in my mind. The four white wines share a common name – The Aromatics. They are also sourced from the oldest vines we could find. There are two versions of Chenin Blanc – a dry style modeled on Savennières, and an off-dry style modeled on Vouvray. I’ve given them the somewhat fanciful names of Cheninières and Chevray. There is an old vine Riesling, and a Pinot Gris from a vineyard planted about 20 years ago. All five wines are priced modestly, and will be distributed in western Washington by Cavatappi. There is much more on the horizon for Waitsburg Cellars, but for today it’s sufficient to let the wines speak for themselves, and see where they take us from here. 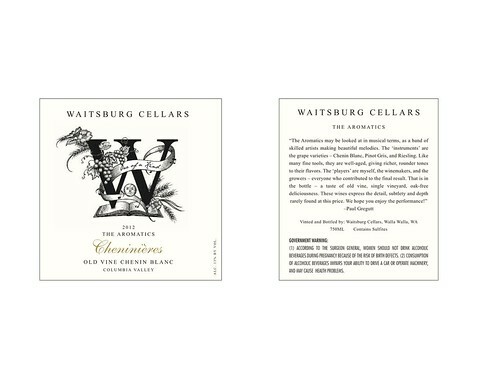 The Waitsburg Cellars logo, pictured above, has a long story associated with each of its components. If you are interested in following along, please visit Waitsburg Cellars. Exciting! How do we get some? Congratulations, Paul. Looking forward to trying these interesting wines!